Dec. 21, 2017 - PRLog -- ITU and UN Women this week announced the winners and 15 finalists for the 2017 EQUALS in Tech Awards. As the flagship event of the EQUALS global network partnership, the annual award event is designed to showcase how ICTs can be used. The awards are part of the EQUALS Global Partnership, a network of more than 50 partner companies and organizations working together to bridge the digital gender divide, and co-founded by the International Telecommunication Union (ITU), UN Women, the International Trade Centre, GSMA and the United Nations University. This year, there were 293 participants from 72 countries for the EQUALS in Tech Awards. 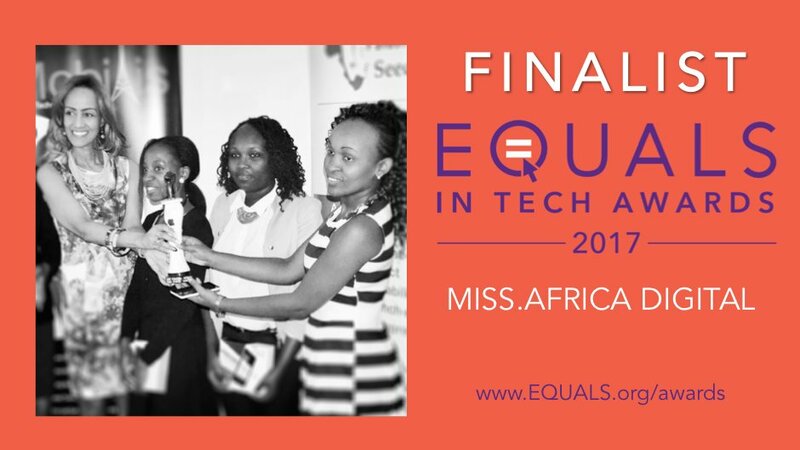 From these, 15 finalists including our Miss.Africa digital program were selected representing the most innovative and inspiring initiatives working to bridge the digital gender divide. A winner was then selected in each of the three categories by an expert panel of EQUALS partners and previous winners. Our most popular Miss.Africa Annual Seed Fund competition is run Africa-wide, and provides grants to women and girls that have submitted original projects in the STEM fields. The grant assists these women to launch or further support their own initiatives. The Miss.Africa Digital Program aims to develop hands-on solutions to Africa's many needs through innovation and technology inclusion. a) Sharing success stories and experiences of women-in-tech through Miss.Africa Voices (http://dotconnectafrica.org/miss.africa/miss-africa-voices), a regular online video journal. An African proverb states, 'If you educate a woman, you educate a family (or nation)'. Skills in tech for women are important because women bring an important perspective. According to the World Economic Forum, women hold only 26 percent of all tech jobs. If current gender gap trends persist, women are at risk of losing out on tomorrow's best jobs and entrepreneurship opportunities. We trust that the experiences we share from our current cohorts and alumni will reveal how developing the digital skills of women and girls. Our partners and supporters will also be motivated to do more to keep our programs alive. Miss.Africa Digital Program was among 15 Finalists in three categories. The 2017 winners were announced yesterday (https://www.equals.org/single-post/2017/12/19/Outstanding-initiatives-bringing-digital-tech-opportunities-to-women-in-Lebanon-Afghanistan-and-Costa-Rica-win-at-2017-EQUALS-in-Tech-Awards) at the IGF 2017 in Geneva, Switzerland. They include:- Lebanese Alternative Learning (Lebanon) in the ACCESS Category, Digital Citizen Fund (Afghanistan/US), SKILLS Category and Sula Batsu Cooperativa (Costa Rica) in the LEADERSHIP Category. Congratulations to all winners and finalists!! !